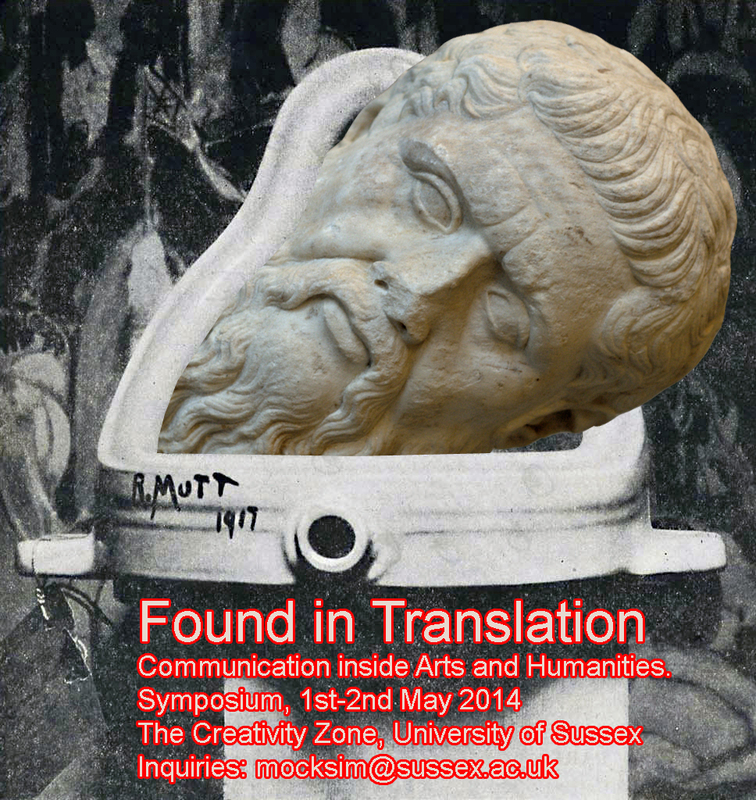 Found in Translation (FIT) is a 2-day symposium, on May 1-2 2014, in the Attenborough Centre Creativity Zone, University of Sussex, as part of the series: Intra-disciplinary collaboration: communication within Arts and Humanities. Typically attention is given to the value of interdisciplinary activity across broad fields such as art and science. Funding is regularly allocated for the development of protocols and to assist communication between these traditions. What happens to communication across different disciplines within arts and humanities? How does translation of activity and information from one medium, or specialist arts or humanities area, into another allow knowledge to be explored in different ways? Can the process, including misunderstanding and learning, be considered a creative act in itself? Concretely it is the case that much is taken for granted even in conversations between practitioners from different arts practice backgrounds such as music composition, film and visual art. When Humanities strands are considered the potential for confusion, or worse, fear of collaboration, is amplified. This is despite the fact that many practitioners, academics and researchers collaborate and draw frequently on each others’ fields. Artists often refer to philosophical theories or history, film makers work with designers and composers for example. The symposium is oriented towards both arts practice-led and humanities based research students as well as faculty, working practitioners, artists and professional creative organisations. The initiative was instigated by Creative Critical Practice Research Group(CCPRG) based at University of Sussex through discussions with Professor of Performance Technologies, Sally-Jane Norman, and is hosted by the Attenborough Centre Creativity Zone, which is providing key resources for FIT. The symposium also benefits from support and endorsement from the open access academic platform REFRAME, doctoral students from the University of Sussex, Royal College of Art, Universities of Brighton, West London, Glasgow, linkages with the University of Dundee, the Consortium for the Humanities and the Arts Southeast England (CHASE) and additional funding kindly provided by the University of Kingston. Day 1: Dr Mary Anne Francis, University of Brighton, will discuss the function of translation in a multi-modal arts practice and in relation to multi-disciplinary research. Day 2: Prof. Simon Penny, University of California Irvine, will draw on his artist-engineer background and experience as founding director of the Arts, Computation and Engineering Masters programme at UCI.